Sometime around 900 A.D., the islands off the coast of Scotland were colonized by Norse people who brought with them the ancestors of the Shetland Sheepdog. These ancestors were Spitz-type dogs, probably similar in type to today’s Icelandic Sheepdog and the Swedish Vallhund. Over time, the Shetland islanders developed a small, highly intelligent dog, capable of herding with little or no supervision. The island’s harsh climate required a hardy, small dog with a thick, weather-resistant coat. In the 15th century, Shetland became part of Scotland and began importing sheep from the mainland. The Scottish Collie, then slightly smaller than today’s breed, was crossed with the Shetland dogs to give the island breed a more distinct Collie-like appearance. Today, the Shetland Sheepdog is a popular companion and working dog, excelling at all events requiring intelligence and agility. 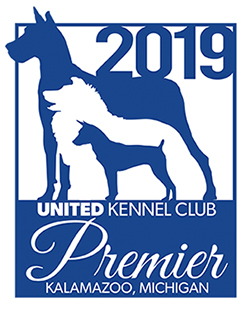 The United Kennel Club has recognized this breed since 1948. The general appearance of the Shetland Sheepdog is that of a Rough Collie in miniature. A male Sheltie should appear distinctly masculine, and a female distinctly feminine. The Shetland Sheepdog is affectionate, loyal, highly intelligent and an extremely willing worker. Shelties may be wary with strangers but are intensely devoted to their family members, including children and other dogs. Shelties excel in performance events, and many still serve as working farm dogs. Shelties make excellent guard dogs, alerting to any intrusion with enthusiastic barking. Faults: Shyness, timidity, nervousness, snappishness. The head is refined but proportionate to the size of the body. When viewed from the side, the skull and muzzle are of equal length, parallel, and joined by a slight but definite stop. 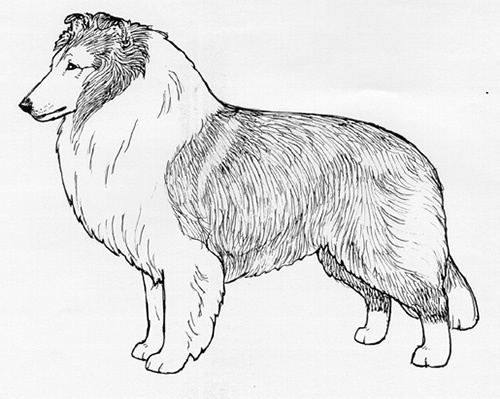 Viewed from the front and the side, the Shetland Sheepdog’s head forms a long, blunt wedge shape. Faults: Skull and muzzle not parallel or of equal length; stop too prominent or absent. The skull is flat and of moderate width. The occiput is not prominent. The skull tapers slightly toward the muzzle. Cheeks are flat. Faults: Prominent occiput; broad or domed skull; prominent cheekbones. Jaws are clean and powerful, with a well-developed underjaw, rounded at the chin that extends to the base of the nostrils. Lips are tight and black. Faults: Snippy muzzle; short, receding, narrow or shallow underjaw; Roman nose. The Shetland Sheepdog has a complete set of evenly spaced, white teeth meeting in a scissors bite. Faults: Overshot or undershot bite; missing or crooked teeth; teeth visible when mouth closed. The nose is black, and projects somewhat over the mouth. Correct eye color, shape and placement is essential to proper Sheltie expression, which is alert, intelligent, and gentle. Eyes are medium in size, almond shaped, and set somewhat obliquely. The inner corner of the eye marks the central point of the stop. Eye color is dark brown, except that blue merles, sable merles, and predominately whites with merle coloration on the head may have one or both eyes blue or flecked with blue. Eye rims are black. Haw should not be visible. Faults: Eyes too light, too large, too small, or too round; visible haw; blue or blue-flecked eyes with any coat color other than merle or predominately white with merle. Correct ear set and carriage are essential to proper Sheltie expression. Ears are small, moderately wide at the base, and fairly high set, but not so high as to give a sharp, terrier-like appearance. When alert, ears are carried semi-erect with the top one-fourth of the ear dropping forward. Otherwise, ears may be folded lengthwise and laid back into the ruff. Faults: Ears set too low or too high; erect, drop, bat, or twisted ears; ear leather too thick or too thin. The muscular, well-arched neck is sufficiently long to enable the head to be carried proudly, blending smoothly into well-laid-back shoulders. Shoulders are smoothly muscled. The shoulder blades are well laid back. The upper arm appears to be equal in length to the shoulder blade and joins it at an apparent right angle. Elbows are close to the body. The forelegs are straight with strong, but not heavy, bone that is oval in shape. Pasterns are strong, flexible and slightly sloping. Viewed from the front, the forelegs are parallel. Viewed from the side, the point of elbow is directly below the withers, and equidistant from the withers and the ground. Faults: Upright shoulders; short upper arm; insufficient angulation; loose shoulders; out at elbows; crooked legs; bone too heavy or too light. The body is slightly longer than tall, measured from prosternum to point of buttocks, but the length is derived from good angulation and not actual length of back. Whether the dog is standing or moving, the line of the back is strong and level from the withers to the gradually sloping croup. The loin is moderately short, muscular and slightly arched, with very little tuck-up. The ribs extend well back and are well sprung out from the spine, then curving down and inward to form a deep body. The brisket extends to the elbow. Viewed from the front, the chest is well filled and of moderate width. Faults: Back too long, too short, swayed, or roached; barrel ribs or slab sided; narrow or shallow chest; croup too steep or too flat; croup higher than withers. The hindquarters are broad and muscular. In profile, the croup slopes slightly. The angulation of the hindquarters is in balance with the angulation of the forequarters. The stifles are well bent, and the hocks are well let down. Hock joint is clean cut. When the dog is standing, the short, strong rear pasterns are perpendicular to the ground and, viewed from the rear, parallel to one another. Faults: Poorly muscled thighs; poorly defined hock joint; hocks turning in or out. Feet are compact, well knit, and oval in shape. Toes are well arched and pads are thick and hard. Nails are strong. Dewclaws may be removed. Faults: Feet turning in or out; round, splay or hare foot. The tail is set low, forming a natural extension of the topline. It is thicker at the base and tapers to the tip. A tail of the correct length extends at least to the hock. When the dog is relaxed, the tail hangs down naturally or with a slight upward curve. When the dog is moving or alert, the tail may be raised slightly, but never higher than the line of the back. Faults: Tail too short; kinked tail. The Shetland Sheepdog has a thick, weather-resistant, double coat. The outer coat is long, harsh textured and straight. The undercoat is soft, short, and dense. The coat stands away from the body and is noticeably more profuse on males than females. The neck is heavily coated forming an impressive mane, frill and apron. The front of the forelegs are covered with short, smooth hair while the back sides are well feathered. The rump and hind legs down to the hock are covered with thick hair that forms the characteristic “trousers.” The tail is richly plumed. Hair on the face, tips of ears, feet and hocks is smooth. Trimming of these smooth areas is allowed. Faults: Short or flat coat; absence of undercoat; wavy, curly, soft, or silky texture. Acceptable colors include: black, blue merle, sable, sable merle, and predominantly white. The black, blue merle, sable, and sable merle are marked with varying amounts of white, tan, or white and tan trim. Sable ranges from golden through mahogany. The predominantly white has a sable, black, blue merle or sable merle head, with or without tan trim, and the body has small amounts of like-colored markings. White should never predominate on the head and should never surround the eyes. The ears should also be predominately colored. When evaluating the relative merit of dogs, faults and merits of color and markings are always secondary to those of physical soundness and gait, except that a dog with the serious color faults described below should never be considered for awards in conformation competition. Faults: Rustiness in a black or blue merle coat; washed-out colors, such as pale sable or faded blue; self-colored blue or sable merle with no merling or mottling. Serious Faults: Predominately white head. Disqualifications: Albinism; brindle; white surrounding one or both eyes; one or both ears predominately white. Height for a mature Shetland Sheepdog ranges between 13 and 16 inches. Weight is proportionate to height. The Shetland Sheepdog is a herding dog that requires an easy, almost floating movement, agility, and endurance. The correct shoulder assembly and well-fitted elbows allow a long, free stride in front. The forelegs should reach well forward without too much lift. Viewed from the front, the legs move in nearly parallel planes, inclining slightly more inward as speed increases. Hind legs should drive well under the body and move on a line with forelegs, with hocks turning neither in nor out. Feet should have no tendency to swing out, cross over, or interfere with each other. Short, choppy movement; rolling or high-stepping gait; or overly close or overly wide movement are incorrect. Height above 16 inches or below 13 inches. White surrounding one or both eyes. One or both ears predominately white.